Cervical cancer is a unique disease from a preventive perspective, as it is the second most common cancer globally and yet is highly preventable. Cytological screening has decreased the risk for cervical cancer in Sweden but the incidence is no longer falling and the prevalence of its causative agent human papillomavirus (HPV) is increasing in the population. New prevention tools based on HPV detection and vaccination have the potential to reverse this scenario. Yet, these tools have not been fully implemented. Ensuring their proper implementation and accessibility should be a top priority for public health research. We strive to deliver our results and work in different expert groups to help inform policy. This network includes laboratory and HPV experts, clinicians, epidemiologists, and public health officials. This will create a world-class resource that can be exploited for state-of-the-art public health research including active implementation and evaluation of new preventive strategies. Exploit the Database and Biobank for a comprehensive population-based evaluation of strengths and weaknesses of currently used preventive strategies (so-called Case-Control Audit). The effect of improvements in these strategies will be predicted using mathematical simulation strategies and implemented via Randomized Healthcare Policies. Launch a program where the identified best practices will be implemented as an innovative and stringent Randomized Healthcare Policies. We will use HPV testing as a primary screening method and will offer conventional cytological cervical screening only to HPV-positive women, allowing us to determine the effects of different screening strategies in a real-life clinical setting. Perform an internationally leading evaluation of the benefits and risks of the Swedish HPV vaccination program, using both short- and long-term outcomes i.e. clinical effectiveness, costs, and safety. 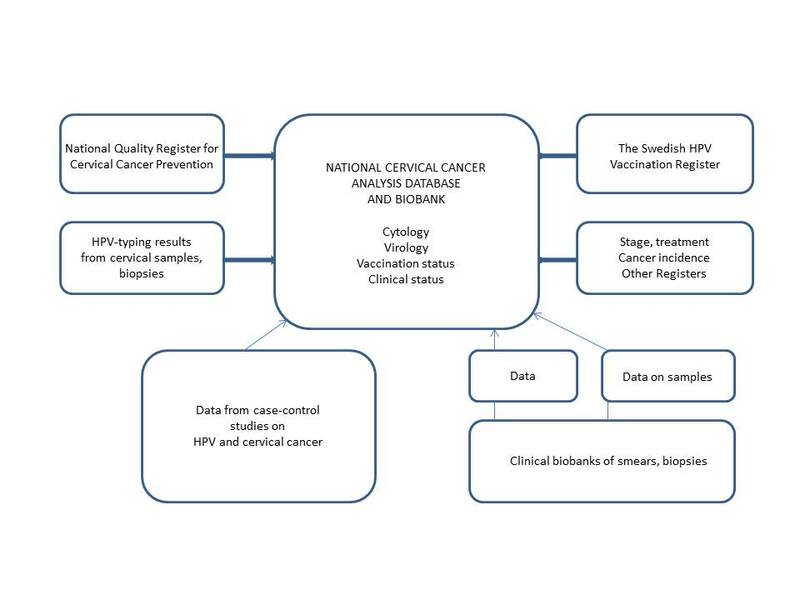 Building of a National Cervical Cancer Analysis Database and Biobank was initiated at the start of the project by linking the National Quality Register for Cervical Cancer Prevention to the Swedish Population Register at Statistics Sweden. By doing so we are able to follow all Swedish women longitudinally for screening participation from as early as 1969 up until the most recently available data. 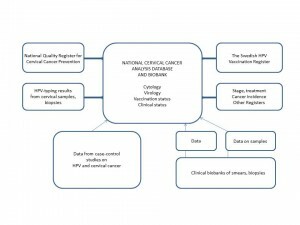 By linking the Swedish HPV vaccination register to the database and other population-based health registers, like the Patient Register, the Prescribed Drug Register, the National CancerRegister and the Causes of Death Register, we can follow each woman for HPV vaccination, cervical screening, and outcomes thereof, including drug use of interest, disease, and eventual death. Data on HPV testing databases, and other biobank information will be added to the database in the coming years. All analyzes are linked anonymised.